Steve Jobs wanted to revolutionize TV in the same way he had transformed music. On page 720 of his biography Steve Jobs, Walter Isaacson asks Jobs about Apple’s plans for television, and Jobs seems quite enthusiastic. It would be an end run around the old ways of receiving TV through a cable subscription, and it would offer television programming directly to customers, on demand. “I finally cracked it,” Jobs says. It all sounds exciting (“magical” even). Apple had irrevocably changed music and cell phones in the previous decade. What better target than the world of television, a fat cow waiting for a dramatic shake-up? And who better than Jobs and Apple to reimagine how consuming TV should look and feel for the next generation? Even if Apple isn’t the company to put it into action, Jobs’s vision will no doubt provide the blueprint for the next wave of “new TV” companies. So what would Jobs’s vision have looked like? The biggest rumor held that Apple was going to launch its own line of flat-panel televisions, putting the company front and center in the home electronics arena. This never came to pass, and the idea remains stuck in the rumor mill. “As soon as next year” is a common refrain. The vision, popularized by both speculative bloggers and professional analysts, is everything you’d expect from Apple—revolutionary, yet far from surprising. You would turn on your TV, and find something similar to iTunes. Hot shows would be promoted up top, and a robust search engine would let you find everything else. The key word is everything. You'd have access to current shows, classic TV, everything. You could download an individual episode, buy a full season pass, or stream shows in real time. You'd pay à la carte for all of it, and you'd no longer spend $80 a month on cable TV. 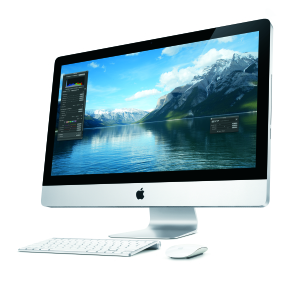 Some believe an Apple television might take its design cues from the iMac. Of course, the hardware would be elegant above all, with the iMac as the natural design inspiration, but oversized for the living room. You’d get a simple remote (as with the current Apple TV), but you could use your iOS device instead. If you've paid a little extra for the “enhanced” version of The Walking Dead, you'd have no need to pause your TV watching with your iPad doing double duty as a TV guide, remote control, and “second screen.” Connections to Facebook, Twitter, and the like would let you get a picture-in-picture stream of gossip and commentary whenever you wanted it. Naturally, Apple wouldn’t leave finding new shows to the masses. Editorial staff and a Genius-like recommendations engine would ensure that you’re never without fresh material to watch. A ratings system, such as the ones that Netflix or TiVo offer, would likely ensure that your voice is heard, too, basing future recommendations on what you tend to watch the most. The system would purportedly store shows on a cloud-based DVR service and be navigable via an icon-driven on-screen interface that mimics the iPad. And thanks to the cloud storage, content would be available on any (Apple) device. (The story discussed only a set-top box, not a full TV.) Commentary and sharing over Twitter and other social networks might also be included. Details are vague, but the device outlined appears to follow the app-centric approach. For example, users would tap an MTV icon to find out what hijinks are going on up at the Jersey Shore this week, instead of accessing an iTunes-like catalog containing every TV show ever made. Could Apple live with this arrangement? It may have to if it wants to be a serious player in television.